There is no greater tyranny than that which is perpetrated under the shield of the law and in the name of justice. Charles de Secondat. 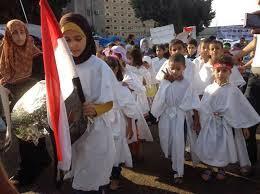 On the 3rd of March 2014, Muslim Brotherhood filed a petition “Save CLEOPATRA = Stop violence against Egyptian Women! 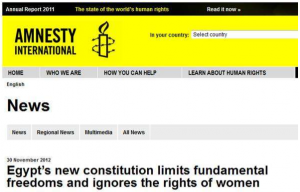 The petition urged the United Nations and the High Commission for Human Rights to condemn the “military coup” and to take adequate procedures to stop the deterioration of human rights situation in Egypt! The same date, 15 Human rights organizations addressed a petition to the United Nations human rights council to apply severe sanctions against Egypt for violating women rights, children rights, Christians and human rights! On the 2nd of March 2014, The US department of State addressed a report against Egypt for human rights violations! Muslim Brotherhood are trying their utmost to push the world to apply sanctions against Egypt, they even don’t mind that any country out there invade Egypt or launch military attacks against the Egyptian territory, thinking that such acts will bring them to power again. And for this target, MB will do anything including selling their own mothers if they have to! The Muslim Brotherhood not only infiltrated the US administration, but also the human rights organizations. The world is ruled by a bunch of bully double standards criminal governments and the corrupted human rights organizations became a destructive tool against human rights in the hands of a terrorist organization. The usual dirty policy against our region. During the rule of Mohamed Morsi and his Muslim Brothers, the Muslim Brotherhood and the Salafis issued 51 fatwas about women. (Fatwa is a ruling on a point of Islamic law given by a recognized authority). Translated by Raymond Ibrahim, Gatestone institute. 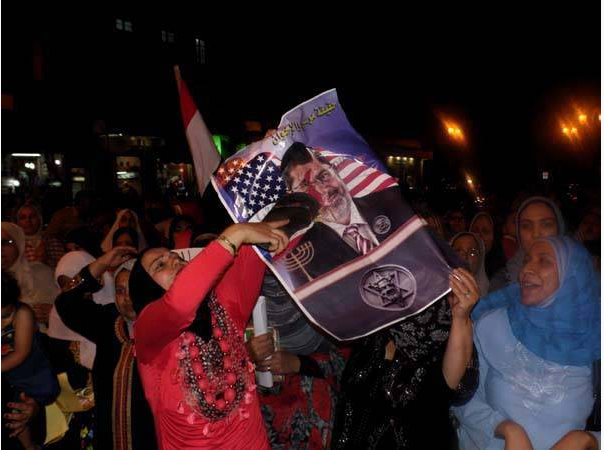 Dr. Sayed Zayed, Alazhar university Cairo, made a study about the Misguided Fatwas of the Muslim Brotherhood and Salafis during the one year rule of Mohamed Mursi. The study reveals a great deal about how MB and Salafists view women. 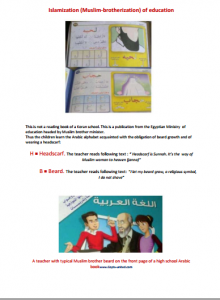 Among these issued Fatwas by Muslim Brotherhood and Salafis, The word “sea” is masculine in Arabic language and when a woman goes swimming, the water touches the woman’s private parts, then she becomes an ‘adulteress’ and should be punished. Women are forbidden from eating certain vegetables or even touching cucumbers or bananas,” due to their phallic imagery, which may tempt women to deviate. Wives are permitted to lie to their husbands concerning politics, if the husband forbids her from being supportive of the Islamists or their agendas. It is unacceptable for women to turn the air conditioning on at home during the absence of their husbands, as this could be used as a sign to indicate to neighbors that the woman is at home alone and any of them could commit adultery with her. The marriage to ten-years-old girls should be allowed to prevent girls “from deviating from the right path,” while another prohibited girls from going to schools located 25 kilometers away from their homes. It is allowed to use women and children as human shields in violent demonstrations and protests, as these are considered jihads to empower Islam. Even slavery was permitted, the enactment of a law allowing divorced women to own slaves,” presumably to help her, as she no longer has a man to support her. Advocating for the destruction of the pyramids and sphinx; scrapping the Camp David Accords; killing anyone protesting against Mohamed Mursi; forbidding Muslims from greeting Christians; forbidding Muslim cab drivers from transporting Christian priests (whose clothing makes them identifiable); forbidding TV shows that mock or make light of Islamists; and forbidding women from marrying any men involved with the former Mubarak government. Muhammad Badie the Supreme Guide of the Muslim Brotherhood Organization in an Interview with Alhayat News Agency on 27/03/2011. The host asked Badie about Muslim Brotherhood’s opinion on Women and Christians running for elections. Badie answered that the Jurisprudence of Muslim Brotherhood don’t allow Christians or Women to run for elections. 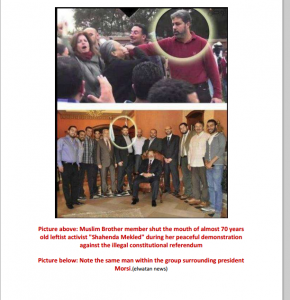 Muslim Brotherhood don’t support Christians nor women to run for elections but only support Muslims to run for elections. He also said that The brotherhood political party is something and the brotherhood organization is something else! Despite that all members and leaders of the organization are the same participants in the political party! The following is the video in Arabic language. Have you ever heard about a political party doing Female genital mutilation? Is there really a difference between Brotherhood political party and the organization? Click here for further violations and aggression of Muslim Brotherhood against women. 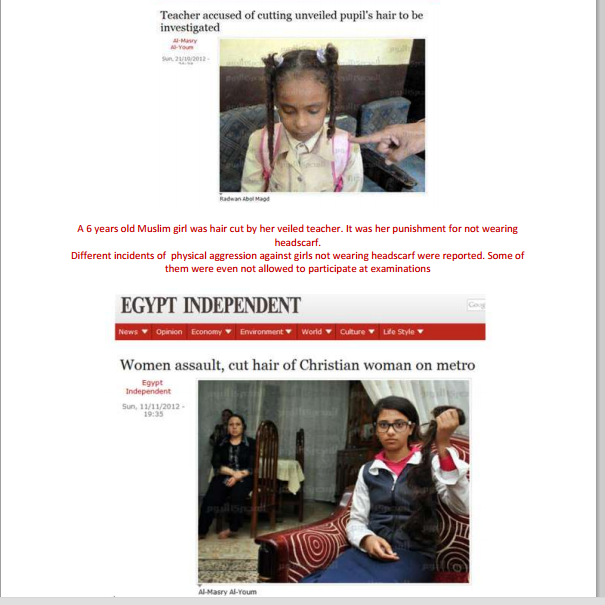 On 11 December 2013, the National Council for women rights in Egypt issued a report about women and children rights violations from 2011 to 2013. 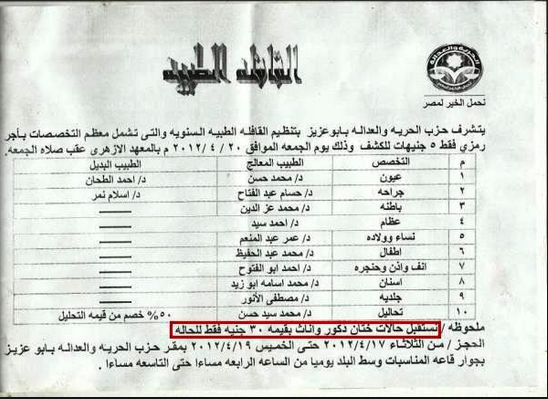 The report stated that about one million 15 and 16 years old girls in Egypt were forced to get married since 2011, and the percentage increased by 22% under the Muslim brotherhood rule from 2012 to 2013 after Muslim Brotherhood and Salafists allowed 9 years old girls marriage. The girls death percentage also increased at the age of 18 due to pregnancy and giving birth at this young age. Dr. Iman Bibars, the Chairman of women advancement association in Egypt declared that women status and rights deteriorated under the Muslim Brotherhood rule due to the abnormal declarations and fatwas issued by Muslim Brotherhood and Salafists. The church construction in Egypt are based on 3 sections: Churches exist already in cities that were invaded by force, must be destroyed like churches in Alexandria; Churches exist already in cities that were not invaded by force, remain the same till they get old and destroyed and it is not allowed to build new ones to restore nor to replace them like churches in Cairo; Churches construction in new cities like in the 10th of Ramadan and Helwan cities, these things must not exist on the Egyptian territory. Another fatwa, if a Muslim man is married to a christian woman and she passed away, in case she was pregnant, it is not allowed to bury her in Muslims graves and her belly must be incised and to bury her baby in a separate grave than hers, so the baby doesn’t get tortured by her guilt for being Christian. 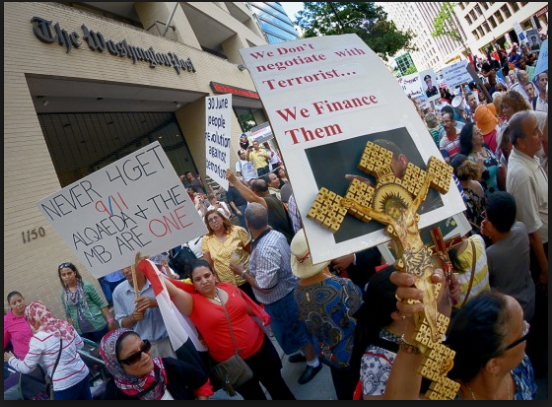 Such inciting Fatwas and many others issued by Muslim Brotherhood were used by Islamist groups in the past in destroying 99 churches, killing about 880 Christians in Egypt, from year 94 to 96 Islamist forced tribute on Christians in Minya and Assiut cities. 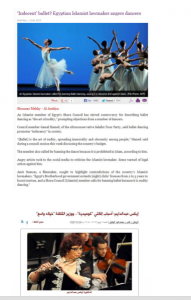 On 21 August 2013, Video of Press conference held by the national council for women rights in Egypt with the attendance of ambassador Mervat Altalawy the chairman of the national council for women rights and counselor Tahany Elgebaly former vice president of the constitutional court. 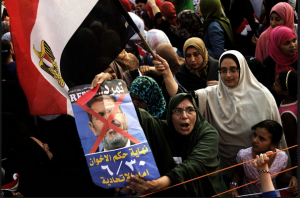 They Declared that Egyptian women despite the oppression and the violations committed against them during Muslim Brotherhood rule, Egyptian women participated positively in demonstrations against the MB violations and refused to be treated as a third class citizens. Unfortunately, the foreign press are biased to terrorism and they mislead their public opinion about what is really happening in Egypt. 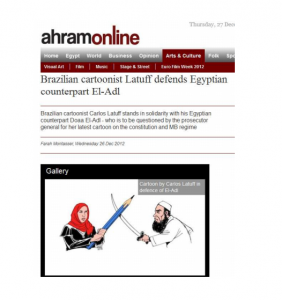 Egyptian women refused terrorism and violent practices committed by Muslim Brotherhood against women rights. The Egyptian women support strongly the Egyptian armed forces in fighting terrorism and totally refused any foreign interference in Egypt internal affairs. The minute 5:50 in the following video, English translation for Muslim Brotherhood terrorism and violence against women and the Egyptian society. Egyptians revolted on 30/6/2013 against Muslim Brotherhood Fascist regime and it was not a military coup, and Egypt is getting punished for fighting terrorism not just by the US administration but also by their politicized foreign press who are biased to terrorism and corrupted human rights organizations beside the US working group against Egypt. If the US really stands for people’s freedom and respect law, order, democracy and human rights, why the US administration is deliberately ignoring Erdogan’s of Turkey corruption, massacres and dictatorship against his own people?! Hamad Bin Khalifa’s royal family in Qatar dictatorship and human rights violations?! Supported violent Ukraine’s demonstrations and called it a revolution, denied 30th of June Egyptian revolution which gathered more than 33 million Egyptian in the most peaceful civilized demonstrations in the entire history?! Why US fights Al-Qaeda and call them terrorists in some regions, support them and call them freedom fighters in other regions?! 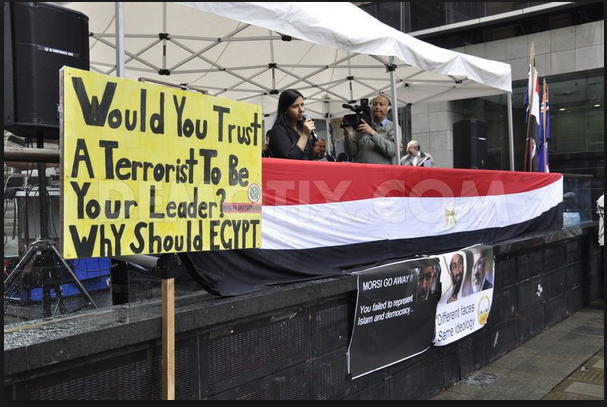 Why US is in total deliberate denial status of all Muslim Brotherhood crimes and violations in Egypt? The US State Department has issued a report on human rights violations in 2013, criticizing the human rights record in other countries, including China. The report looks at the human rights situation in nearly 200 countries and regions, but nothing was mentioned about the human rights problems in the US, such as its improper treatment of detainees at Guantanamo Bay, and its mass surveillance program PRISM. In addition, At a press conference, John Kerry and assistant secretary of State expressed concerns over human rights in Russia, Ukraine, Egypt and other countries. The United States who violated the international laws, invaded and intervened in so many countries just last decade, like Afghanistan and Iraq, plus American bombing operations from Pakistan to Yemen to Libya, attacked and threatened Russia for violating the international laws and interfering in Ukraine’s internal affairs! What a US barefaced insolent double standards and hypocrisy? What can I say, except that The world is ruled by a bunch of sickening insane corrupted men who are applying the law of the Jungle on earth. Did Americans questioned the war criminal George Bush who destroyed Iraq based on a lie? No they didn’t. Did Americans questioned Obama’s administration the war criminal and the sponsor of terrorism in the world who is deliberately destroying the image of America in the entire world, and interfering in other countries internal affairs? No they didn’t. I heard that many Americans prefer to believe almost any lie over the simple truth…if it is more comfortable for them. There was a time I did not believe that, but I do now. America is no longer credible in the world’s eyes, thanks to their US administration who are doing a great job in destroying America’s image in the entire world and spreading hatred and violence against their own citizens because their government is biased to terrorism.